Anyone (as in current school year) who is in Grades 6, 7 & 8th (middle school). What Is The Cost To Attend & What Is Included? It is $45 per athlete! All athletes receive a t-shirt, combine stats (posted on website), good football workout (including position specific drills) and participate in team tryouts! Please note only those who pre-register receive a T-Shirt! Why Should I Bring My Athlete? Nothing to lose and lots of football instruction and fun football times to gain! Whether you feel your athlete(s) have a shot to be selected or not this is a win/win experience. Athletes get to see where they are development wise amongst their peers from across the state. Athletes will also receive some “position specific” technique instruction by our staff hoping they can take back to their team in the fall and make them a more complete player. If your fortunate enough to be selected to the team then it is just an added bonus! There Are 4 Tryouts Do Athletes Have To Attend All 4? If They Wish Can They Attend All 4? Athletes, only MUST attend one of the 4 Tryouts. If they wish they can attend all Tryouts! We have different evaluators at each Tryouts so it is possible that one evaluator may see “something more” in your athlete than another evaluator. What Does Each Athlete Need To Bring? Athletic apparel (t-shirt, shorts, etc) & Cleats. NO equipment is needed for the Open Tryout! How Many Athletes Are Selected For The Teams? We will select between 40 – 50 athletes per team; meaning 40 – 50 (8th Graders) and 40-50 (6th & 7th Graders Combined). When & Where Are The Games Held? When Do The Players Practice? This game is patterned after high school all-star games. Players will report June 18 for “Game Week”. Players will stay on a college campus and practice at the same college campus. Giving them an early glimpse of what life is like for college athletes. Players will have a minute by minute planned itinerary for the 4 days there in our care. Is There Cost For A Selected Player? Yes, the costs are all-inclusive meaning it covers ALL Housing, Meals, Transportation to game, Team Apparel, Game Uniform, Player Ticket to Banquet and more. Once Players are selected they receive a VERY detailed email with all needed paperwork and instructions. All selected athletes will get to tour a major college campus. Selected athletes who have strong academics will be recognized for their outstanding achievements in the classroom. In winter 2009 Ricco Hughes and Josh Jones began making plans for the 1st Annual Kentucky vs. Tennessee Future Stars Classic. Hughes is credited with coming with the popular and catchy name “Future Stars”. The goal behind beginning Future Stars was too put each states BEST athletes on a stage and give them a chance to showcase there talents, gain some exposure heading into high school and give them a week to remember for the rest of their life. We wanted the athletes to be able to live like college athletes for a few days to give them an early taste of what its like hoping that will motivate each athlete even more into playing college football one day. To select the teams we felt the Combine / Open Tryout was the best way to “fairly” select the athletes. Unlike other all-star games where you get in on “who you know” or “how much money your parents have” this game was simply out to get the VERY best regardless of who they knew or how much money they had. 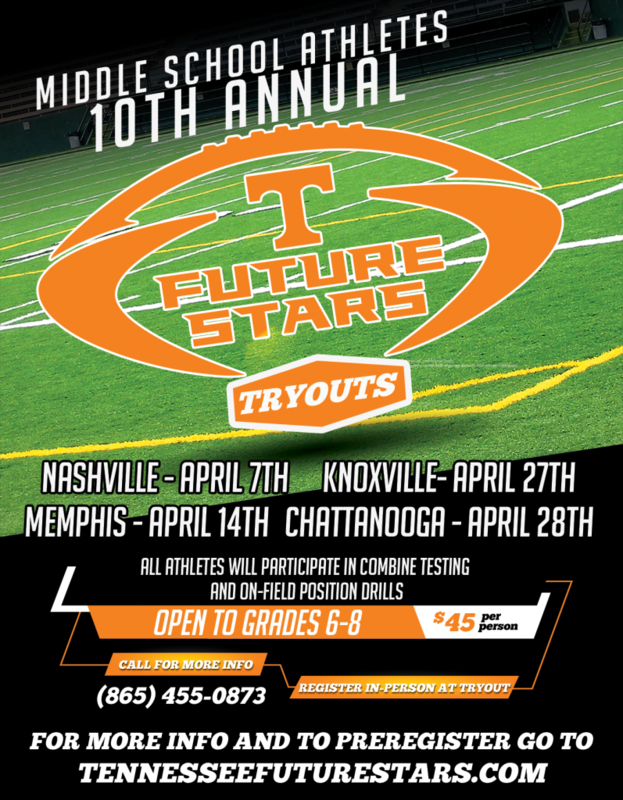 In April 2010 our first ever Combine / Open Tryout was held in Knoxville, TN, exactly 229 young athletes attended from all across Tennessee with the hopes of being selected for a roster spot in the first annual game. The game was played June 2010 in Louisville, KY. Both games (7th & 8th Grade) were highly competitive! Tennessee was fortunate to come out on top 33-13 and 17-7 (7th & 8th Grade) respectively. The players and coaches had an awesome experience. Our goal is to provide each athlete that we come in contact with a positive football experience at our events; whether it be at an Open Tryout or during game week we want everyone walking away feeling they had a good experience.